Collectors Contemporary is an online gallery specializing in the sale of important works of contemporary art featuring both masters and established artists. Quality remains our utmost criterion in works we present. Our art works are sold with existing frame or upon special orders relating to mounting and framing of work. Upon request, artworks may also be acquired unframed and professionally packed for shipping. 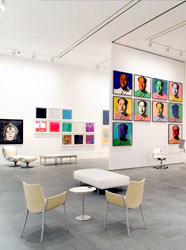 Quotations are valid for four working days after which the gallery reserves the right to alter its prices should circumstances compel such action. The gallery now functions on an online platform and does not operate at any physical gallery or exhibition space. The Gallery reserves all discretion to modify any dates, duration and content of exhibitions listed, announced or organised. All images and texts are copyrighted to the respective artists, writers and lawful proprietary rights owners and may not be downloaded, reproduced, circulated and/or otherwise used without the written consent of the owners. All enquiries about image and text usage must be directed to the Gallery. Gallery Policy | Copyright © 2019 COLLECTORS CONTEMPORARY PTE LTD. All Rights Reserved.